Looking to go fishing in Texas and want to know where the best places are? With hundreds of miles of coastline along the Gulf of Mexico, as well as plenty of inland lakes and rivers, finding lots of opportunities to fish should be pretty easy. But we want to help guide you to some of the best fishing spots in the Lone Star State, so we have put together a list of some of our favorites. Whether you’re planning on paddling, wading, or fishing from the shore, there’s something for everyone. Just a little over an hour’s drive north of Corpus Christi, San Antonio Bay is located on the Gulf Coast, between the bays of Aransas and Matagorda. There are excellent opportunities to catch a range of saltwater fish, including spotted sea trout, snapper, red and black drum, and flounder. There is also a large wildlife refuge, where there is a combination of saltwater and freshwater marshes, meaning you’re likely to see some other Texan wildlife while you’re fishing, such as whooping cranes, egrets, turtles and alligators. There are plenty of places to get out there and fish, whether you want to fish from a jetty, paddle out in your kayak, wade out, or take your boat out, there is no shortage of fishing spots in San Antonio Bay. The Guadalupe River, located between Austin and San Antonio, in Texas Hill Country, is a beautiful river that is popular in the summer months for tubing and canoeing, in addition to being a great place for fishing all year round. One of the main draws for this river is the rainbow trout that can be caught no matter what the season and it also boasts being the most southerly trout fishery in the USA. You can fish for other species too, including various bass and sunfish. 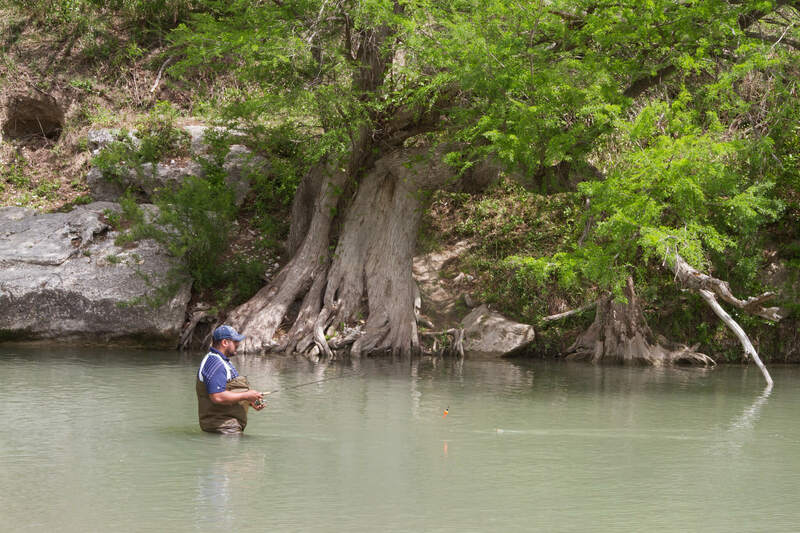 The best trout fishing can be found in the river between the Canyon Lake Dam and the town of New Braunfels. If you’re looking to take your kayak on your fishing trip, the Guadalupe River could be a good day out. Around 65 miles to the east of Dallas you’ll find Lake Fork, a large lake with lots of inlets and four public boat ramps that are operated by the Sabine River Authority. Fishing for largemouth bass is popular in Lake Fork but you can also find channel catfish, large blue catfish, as well as crappie and large white bass. In order to boost your fishing success the lake also has several man-made fish attractors, which are underwater areas that are designed to be more appealing for fish to hide out in, so you can lure in a larger catch. There are also plenty of camping sites and RV parks in the area if you want to make it a weekend trip. Located between San Antonio and Corpus Christi, Choke Canyon Reservoir offers good fishing opportunities surrounded by wildlife in a natural environment. On the southern side of the reservoir is Choke Canyon State Park, where you can set up camp or launch your watercraft. Within the State Park you can also fish from the shore without needing a fishing licence. There are a variety of different fish species in the lake, including various bass and sunfish, crappie, catfish and freshwater drum. The area is also home to alligators, Rio Grande turkeys, white-tailed deer, coyote and a lot more, so it could be an interesting day out. Have you been fishing in or around TX? Or do you have plans to soon? Hey, maybe there's better places to land a catch than what we've mentioned? Why not tell us about it below.